There are several issues relating to the area of personnel in this field that make issues of education and professional definition more complex and difficult to define. The field has changing requirements and increasing needs (largely because industry and government ignored the warnings some of us were sounding many years ago, but that is another story, oft told -- and ignored). When I talk about educational and personnel needs, I discuss it metaphorically, using two dimensions. 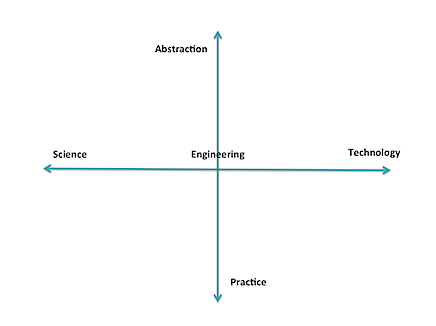 Along one axis is the continuum (with an arbitrary directionality) of science, engineering, and technology. Science is the study of fundamental properties and investigation of what is possible -- and the bounds on that possibility. Engineering is the study of design and building new artifacts under constraints. Technology is the study of how to choose from existing artifacts and employ them effectively to solve problems. The second axis is the range of pure practice to abstraction. This axis is less linear than the other (which is not exactly linear, either), and I don't yet have a good scale for it. However, conceptually I relate it to applying levels of abstraction and anticipation. At its "practice" end are those who actually put in the settings and read the logs of currently-existing artifacts; they do almost no hypothesizing. Moving the other direction we see increasing interaction with abstract thought, people and systems, including operations, law enforcement, management, economics, politics, and eventually, pure theory. At one end, it is "hands-on" with the technology, and at the other is pure interaction with people and abstractions, and perhaps no contact with the technology. There are also levels of mastery involved for different tasks, such as articulated in Bloom's Taxonomy of learning. Adding that in would provide more complexity than can fit in this blog entry (which is already too long). The means of acquisition of necessary expertise varies for any position within this field. Many technicians can be effective with simple training, sometimes with at most on-the-job experience. They usually need little or no background beyond everyday practice. Those at the extremes of abstract thought in theory or policy need considerably more background, of the form we generally associate with higher education (although that is not strictly required), often with advanced degrees. And, of course, throughout, people need some innate abilities and motivation for the role they seek; Not everyone has ability, innate or developed, for each task area. We have need of the full spectrum of these different forms of expertise, with government and industry currently putting an emphasis on the extremes of the quadrant involving technology/practice -- they have problems, now, and want people to populate the "digital ramparts" to defend them. This emphasis applies to those who operate the IDS and firewalls, but also to those who find ways to exploit existing systems (that is an area I believe has been overemphasized by government. Cf. my old blog post and a recent post by Gary McGraw). Many, if not most, of these people can acquire needed skills via training -- such as are acquired on the job, in 1-10 day "minicourses" provided by commercial organizations, and vocational education (e.g, some secondary ed, 2-year degree programs). These kinds of roles are easily designated with testing and course completion certificates. Note carefully that there is no value statement being made here -- deeply technical roles are fundamental to civilization as we know it. The plumbers, electricians, EMTs, police, mechanics, clerks, and so on are key to our quality of life. The programs that prepare people for those careers are vital, too. Of course, there are also careers that are directly located in many other places in the abstract plane illustrated above: scientists, software engineers, managers, policy makers, and even bow tie-wearing professors. One problem comes about when we try to impose sharply-defined categories on all of this, and say that person X has sufficient mastery of the category to perform tasks A, B, and C that are perceived as part of that category. However, those categories are necessarily shifting, not well-defined, and new needs are constantly arising. For instance, we have someone well trained in selecting and operating firewalls and IDS, but suddenly she is confronted with the need to investigate a possible act of nation-state espionage, determine what was done, and how it happened. Or, she is asked to set corporate policy for use of BYOD without knowledge of all the various job functions and people involved. Further deployment of mobile and embedded computing will add further shifts. The skills to do most of these tasks are not easily designated, although a combination of certificates and experience may be useful. Too many (current) educational programs stress only the technology -- and many others include significant technology training components because of pressure by outside entities -- rather than a full spectrum of education and skills. We have a real shortage of people who have any significant insight into the scope of application of policy, management, law, economics, psychology and the like to cybersecurity, although arguably, those are some of the problems most obvious to those who have the long view. (BTW, that is why CERIAS was founded 15 years ago including faculty in nearly 20 academic departments: "cybersecurity" is not solely a technology issue; this has more recently been recognized by several other universities that are now also treating it holistically.) These other skill areas often require deeper education and repetition of exercises involving abstract thought. It seems that not as many people are naturally capable of mastering these skills. The primary means we use to designate mastery is through postsecondary degrees, although their exact meaning does vary based on the granting institution. So, consider some the bottom line questions of "professionalization" -- what is, exactly, the profession? What purposes does it serve to delineate one or more niche areas, especially in a domain of knowledge and practice that changes so rapidly? Who should define those areas? Do we require some certification to practice in the field? Given the above, I would contend that too many people have too narrow a view of the domain, and they are seeking some way of ensuring competence only for their narrow application needs. There is therefore a risk that imposing "professional certifications" on this field would both serve to further skew the perception of what is involved, and discourage development of some needed expertise. Defining narrow paths or skill sets for "the profession" might well do the same. Furthermore, much of the body of knowledge is heuristics and "best practice" that has little basis in sound science and engineering. Calling someone in the 1600s a "medical professional" because he knew how to let blood, apply leeches, and hack off limbs with a carpenter's saw using assistants to hold down the unanesthitized patient creates a certain cognitive dissonance; today, calling someone a "cyber security professional" based on knowledge of how to configure Windows, deploy a firewall, and install anti-virus programs should probably be viewed as a similar oddity. We need to evolve to where the deployed base isn't so flawed, and we have some knowledge of what security really is -- evolve from the equivalent of "sawbones" to infectious disease specialists. We have already seen some of this unfortunate side-effect with the DOD requirements for certifications. Now DOD is about to revisit the requirements, because they have found that many people with certifications don't have the skills they (DOD) think they want. Arguably, people who enter careers and seek (and receive) certification are professionals, at least in a current sense of that word. It is not their fault that the employers don't understand the profession and the nature of the field. Also notable are cases of people with extensive experience and education, who exceed the real needs, but are not eligible for employment because they have not paid for the courses and exams serving as gateways for particular certificates -- and cash cows for their issuing organizations. There are many disconnects in all of this. We also saw skew develop in the academic CAE program. Here is a short parable that also has implications for this topic. In the early 1900s, officials with the Bell company (telephones) were very concerned. They told officials and the public that there was a looming personnel crisis. They predicted that, at the then-current rate of growth, by the end of the century everyone in the country would need to be a telephone operator or telephone installer. Clearly, this was impossible. Fast forward to recent times. Those early predictions were correct. Everyone was an installer -- each could buy a phone at the corner store, and plug it into a jack in the wall at home. Or, simpler yet, they could buy cellphones that were already on. And everyone was an operator -- instead of using plugboards and directory assistance, they would use an online service to get a phone number and enter it in the keypad (or speed dial from memory). What happened? Focused research, technology evolution, investment in infrastructure, economics, policy, and psychology (among others) interacted to "shift the paradigm" to one that no longer had the looming personnel problems. If we devoted more resources and attention to the broadly focused issues of information protection (not "cyber" -- can we put that term to rest? ), we might well obviate many of the problems that now require legions of technicians. Why do we have firewalls and IDS? In large part, because the underlying software and hardware was not designed for use in an open environment, and its development is terribly buggy and poorly configured. The languages, systems, protocols, and personnel involved in the current infrastructure all need rethinking and reengineering. But so long as the powers-that-be emphasize retaining (and expanding) legacy artifacts and compatibility based on up-front expense instead of overall quality, and in training yet more people to be the "cyber operators" defending those poor choices, we are not going to make the advances necessary to move beyond them (and, to repeat, many of us have been warning about that for decades). And we are never going to have enough "professionals" to keep them safe. We are focusing on the short term and will lose the overall struggle; we need to evolve our way out of the problems, not meet them with an ever-growing band of mercenaries. The bottom line? We should be very cautious in defining what a "professional" is in this field so that we don't institutionalize limitations and bad practices. And we should do more to broaden the scope of education for those who work in those "professions" to ensure that their focus -- and skills -- are not so limited as to miss important features that should be part of what they do. As one glaring example, think "privacy" -- how many of the "professionals" working in the field have a good grounding and concern about preserving privacy (and other civil rights) in what they do? Where is privacy even mentioned in "cybersecurity"? What else are they missing? [3/2/2013] While at the RSA Conference, I was interviewed by the Information Security Media Group on the topic of cyber workforce. The video is available online.